Congratulations to teams from ECU, Cottenham, Letchworth, Peterborough and Soham who won through the National Cup Qualifiers at Ross Peers Sports Centre on Saturday and Sunday 23rd and 24th March. 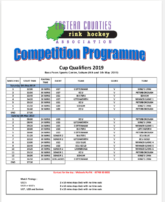 ECRHA have at least one team in the final in each of these age groups. These teams qualified for the finals on 22nd June in Middlesborough. Thanks to the NRHA for organising the competition, and to all the players, coaches, referees, parents and supporters from around the country who all played their part in a great weekend of Rink Hockey.